Gwen Stacy was meant to stay dead. Her death back in 1973 in Amazing Spider-Man #121, by Gerry Conway and Gil Kane, was a mark of maturation for the genre, a sign that superhero comics were ready to embrace more sophisticated storytelling. Her death became as defining to Spider-Man's story as that of his Uncle Ben. It could never be undone. But there's no such thing as "never" in superhero fiction. Gwen Stacy is back -- sort of. 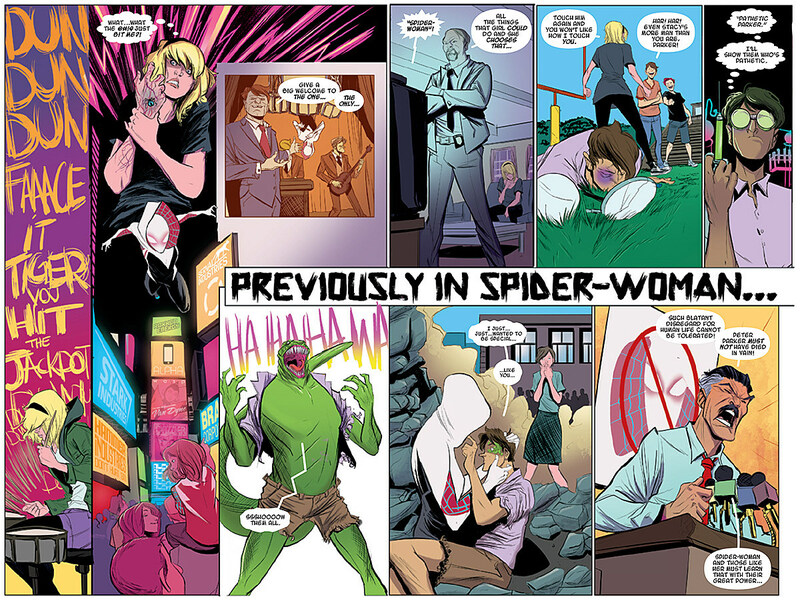 The character's debut as another reality's Spider-Woman in Edge of Spider-Verse #2 by writer Jason Latour, artist Robbi Rodriguez, and colorist Rico Renzi was so well received that the character will spin off into her own ongoing series, Spider-Gwen -- created by the same team, and set in a world where Peter Parker is just as dead as Gwen Stacy is in the main Marvel Universe. ComicsAlliance spoke to Latour, Rodriguez, and Renzi, to find out more about their plans -- and their response to Spider-Gwen's new-found popularity. ComicsAlliance: Bringing Gwen Stacy "back" from the dead always felt like a terrible idea — until now. How did this new vision of Gwen come about, and was there any sense of how strongly people would respond to her? Jason Latour: Well, to be honest I was really aware of how awfully wrong it could have gone. When my editor, Nick Lowe, approached me about doing a new character for Spider-Verse he mentioned that Dan Slott had jotted down a one line sentence that said, “Gwen Stacy as a Spider-Woman,” and that they both liked the idea and wanted someone to run with it. I was initially a little hesitant about that, because when I was a kid reading Spider-Man it was a real hard and fast rule that Gwen Stacy stays dead. But in thinking it over I tried to distance myself from where I come from and look at the idea as it would exist in a modern context. It was really clear that Gwen’s re-emergence in other media had already given her a new life, and that her death and the way it seemed to rub a lot of her newer fans raw was meaningful. It just seemed like there would be a lot of catharsis in Gwen as the hero, instead of the victim. Comics as a culture just seemed ready for it, maybe even owed it. But all that said… a lot of the response was just dumb luck. There was no way we could have predicted any of this. We just set out to tell a good story, and we got extremely lucky that people responded. It’s really mind blowing and humbling and up there with the best and most touching moments of all our careers I think. Design by Robbi Rodriguez. Click to enlarge. CA: Spider-Gwen's costume is one of the best pieces of superhero design I've seen in years. What do you think makes it so effective? Robbi Rodriguez: Well, thanks on that. I'm not sure what exactly makes [it] work. It could be the color choices, it could be the minimalism or it could just be that hoodie. ... Everyone has a favorite aspect and enjoys how the rest works with it. Latour: In my opinion, Robbi just nailed that deceptive mix of simplicity and complexity. There’s a feeling of timelessness to it that I think is only achieved by being influenced by designs outside of comics as much as within. The prompt I handed him was basically: Keep her mysterious and avoid anything that might scream, “Spider-Man’s girlfriend or little sister.” So the covered face and the hoodie and all of that were things Robbi really wanted. It could and should feel like anyone could be under that mask. And boy did he deliver that. CA: You're bringing the whole team back together from Edge of Spider-Verse #2. There was an amazing energy to that issue, and obviously Robbi and Rico created a sustained run of beautiful comics with FBP. 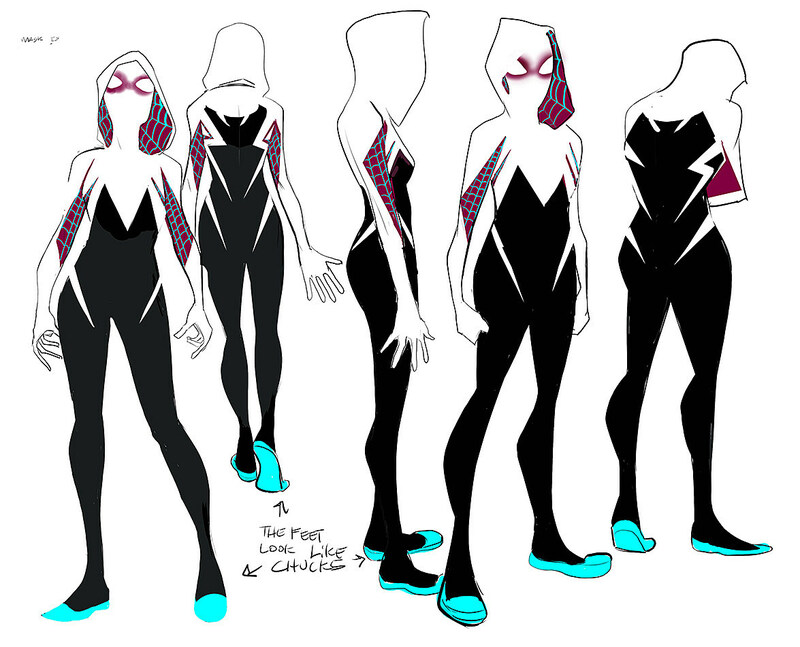 Visually and tonally, what is the approach, strategy and inspiration for Spider-Gwen from the artists' perspective? Rico Renzi: I was really just getting into a groove with Robbi after thirteen issues of FBP, so I just look at this as an extension of what we were doing there. Although the suit Robbi designed has small splashes of color, she's still pretty much black and white, so she's going to pop no matter how nuts we make the backgrounds of her city. CA: From Gwen's band the Mary-Janes, to her relationship with her father, to the death of Peter as the Lizard, you've already built a strong foundation for Gwen's world, but there's still a lot to explore. What's at the top of your list? Latour: We’re going to be picking up right on the heels of Spider-Verse, and that experience will have a big impact on Gwen going forward. To her friends and family, Gwen Stacy went missing. Her band thinks she bailed on them when they needed her most. So when she comes back from Spider-Verse, not only will she be inspired by the Spider-Men and Women she meets to try to be a better super hero, she will also have to pick up the pieces of being Gwen Stacy, and figuring out what that means. Especially in the face of a world that wants to throw her in jail. Of course her father, Captain Stacy, knows her secret, and as the man charged with bringing Spider-Woman to justice, that’s left him in a tough spot. To protect his daughter he’ll have to decide just how much his badge means to him, and if the lessons he’s taught her his whole life hold up in the world they now live in. CA: We've seen several big comic launches lately that seem designed to appeal to a young female audience. Do you think we're seeing an important shift in the industry? Latour: I really hope so. We've seen some significant strides so far in terms of the kinds of characters published, and smaller but significant gains in terms of the diversity of creators behind those characters. I mean look, I’d be the last person to hold this book up as wholly progressive because this is a comic about a teenage girl superhero, mostly produced by a group of men. So being aware of that -- I’m trying to be very careful about not speaking for women. That’s not my place. My approach and my interest in the character is on a human level. When I put myself in Gwen’s shoes I try to do it with same care and investment that I would if I were writing her police captain father, which is pretty foreign to me too. But in setting out to explore those characters honestly, I hope to learn along the way. That seems to be a part of the argument [that] gets a little lost when people advocate for diversity in the marketplace. I really feel that in entertainment the relationships between stories and their authors and their audiences should be somewhat reflexive. A culture where everyone has characters and creators they can not only identify with, but can also be challenged by is good for us all. So I think we're trying to do that, to be challenged by the material, and hope that that effort helps create a good story that does the entire audience justice. If people enjoy reading stories like Spider-Gwen and that contributes in any way to convincing companies like Marvel to be less hesitant to make even bigger changes in the future, I'd be thrilled. Rodriguez: I don't think we came at this project as targeting that demo. We just wanted to make a fun and smart comic that happens to star a female lead. I think you can fall into pandering if your only seeking that audience. My hope if that we make a book that everyone can enjoy. Renzi: My nine-year old daughter is crazy psyched for Spider-Gwen and the more age-appropriate Squirrel Girl books from Marvel, which in turn gets me even more excited about these projects! Robbi Rodriguez. Click to enlarge. CA: Your Spider-Gwen ongoing will be side-by-side with the current Spider-Woman book and the new Silk book, plus Amazing Spider-Man, Ultimate Spider-Man, and Spider-Man 2099. What sets Gwen apart from her fellow spider-heroes? Rodriguez: The fact that we are creating from a far different world than those book will set us apart for sure. Latour: While we lose out a little on the shared threats and allies the other Spider-Men and Women have, we gain the fact that Gwen swims in her own stream. She has her own universe to explore, and I hope that’s as exciting to readers as it is to us… because trust me, we’re going to try and take full advantage of it. 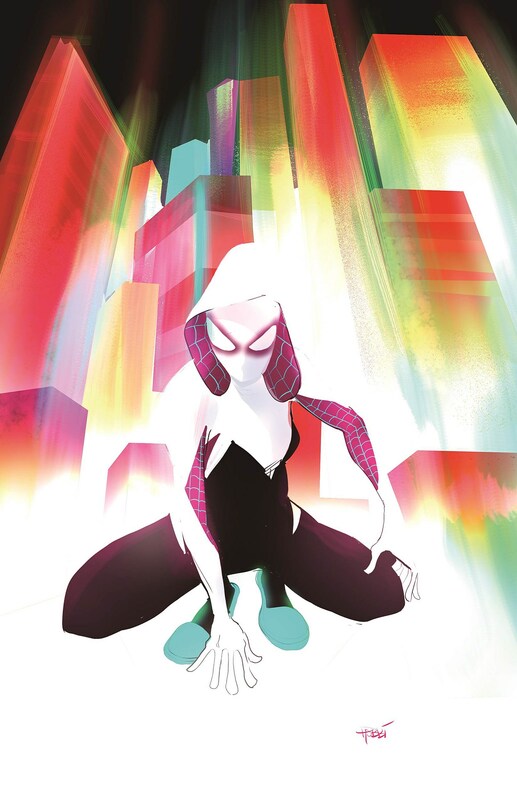 CA: We’re pleased you went with the fan nickname "Spider-Gwen" as the official title of the book. Can you talk about that decision and how it might impact how Gwen is addressed within the narrative itself? Renzi: I think we've been calling this project Spider-Gwen in texts and emails from the start, I'm glad it stuck. Rodriguez: We'll still call her Spider-Woman in the book, for sure. It's just the title of the book, and an easy short hand we've been using for a bit when talking about the one shot to distinguish her from the other Spider-Women books. It is f---ing rad that it crossed over and become it own thing. Much like everything with this issue, it's f---ing rad to see it become something bigger then we imagined. Latour: Tonally it felt important to keep that name. That’s who she is. Equal parts Gwen and Spider-Woman. It also kind of helps me keep in mind that it’s a fun book. One that is free of a some of the baggage you might normally associate with superhero comics. I really want to approach this as a modern superhero book, where the old tropes are re-examined and re-invented a little. So why not a name like Spider-Gwen? Lets have some fun for once in our lives. Spider-Gwen #1 is available online and in stores in February 2015.